“Nidhogg” is the anglicized spelling of the name of the mythological Norse serpent Níðhöggr. This legendary creature was said to constantly gnaw on the roots of Yggdrasil, the tree that connects all worlds. Níðhöggr’s diet also included the condemned souls of murderers and adulterers that wash up on the shores of Hel. 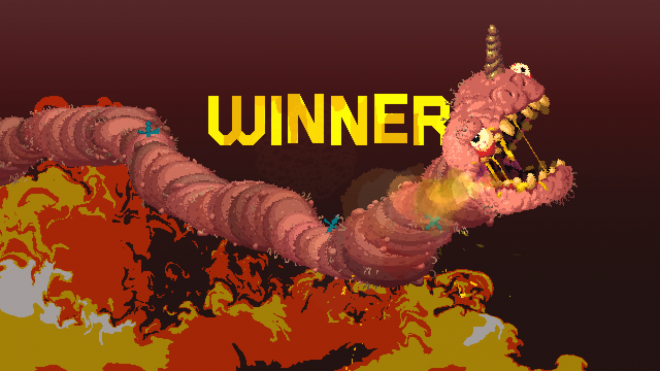 When viewing Nidhogg 2 through the lens of this mythology, the seemingly strange decision to sacrifice its winners to the titular beast makes perfect sense. The victor of the competition is obviously the superior killer, thus making them the tastier snack. If it weren’t for the fact the Nidhogg is depicted as a giant flying worm, I’d say this game was 100% historically accurate. 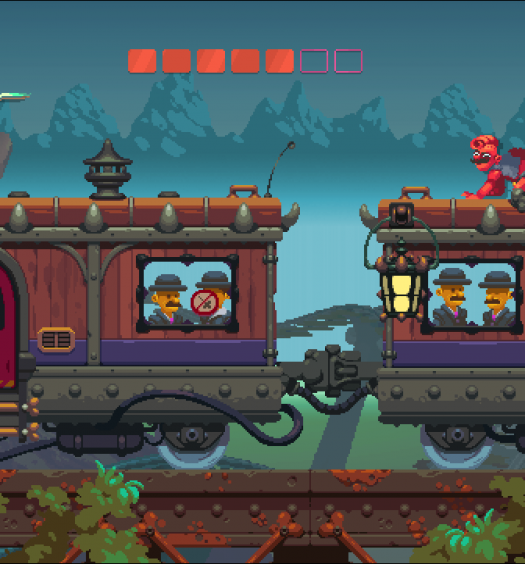 Kill or be killed – Nidhogg 2 is a unique spin on a 2D fighter. A match begins with the two opponents on opposite sides of the screen, brandishing a fencing sword. The goal here, obviously, is to kill the other player. Both characters have the exact same move set, making the playing field perfectly even. The sword can be held at a low, middle or high stance, and a thrust attack can be performed at any position. A single stab mean death, so it’s best to be cautious. It’s a simple setup that plays out like an elegant dance; players will try to outwit each other, scooting back and forth and constantly re-positioning their sword to fake each other out. Swords at the same level will clash; time a position change well enough, and you can knock the sword right out of your adversary’s hand. Then, you go in for the kill – all it takes is a single stab to drain all of the blood from someone’s body. Winning this bout is just the start; the victor is then given control of the screen and can start running towards their goal. The modest jog would be easy if it weren’t for the enemy respawning along the path to play defense. Here’s where you’ll end up using your dirtier moves: jumps and slides that can become stunning kicks, or even chucking your sword across the screen for an instant kill. The offense doesn’t need to kill their opponent in order to progress, but if the defense gets the kill, they steal screen control. This bloody tug of war could theoretically go on forever, only ending once someone finally reaches their end goal. Sword to a knife fight – The original Nidhogg only let you fight with a fencing sword (or fists, if you became unarmed), but here we get three new additions to the arsenal. By default, you’ll cycle through all four in a single match, receiving a different weapon every time you respawn. The broadsword is much clunkier than the original, unable to be held in the middle position but has a wide-sweeping attack that will hit anything in front of you. The dagger hews much closer to the traditional sword, lacking in length but making up for it in speed. Then there’s the odd man out, the bow and arrow. Hold the attack button to draw, then let go to shoot. Being so different makes for a steeper learning curve, but becoming a skilled sharpshooter can be indispensable when spawning at a distance. Every weapon is polished to perfection, balanced to have their own unique strengths and weaknesses that make for unpredictably tense matchups. While there’s still nothing that can beat a classic fencing match, having to deflect arrows with well-timed broadsword swings has its own special thrill. Stab it your way – Matches can be played either locally or online, either in single-serving 1v1 matches or in a bracketed showdown for up to eight players. If the standard gameplay is getting stale, you can always spice it up through a hearty modifier menu. There are the standard changes you’d expect, like setting limits on time or weapon variety, but the real fun comes from the more outlandish “cheats”. From low gravity to being stuck in a crouch, the options presented here are undoubtedly silly but thought out well enough to legitimately change how you approach the game. The single greatest option is the boomerang sword, which causes thrown weapons to reverse course after a set distance. Getting a sword to behead your opponent on its return trip is so unbelievably satisfying it’s a crime this feature isn’t on by default. Screenshots say it all – Aside from the gorgeous waterfall animation behind the title screen, I cannot stand the visuals for this game. This is something that’s bothered me since watching the first trailer, but I chalked that up to merely preferring the original’s minimalist aesthetic. Playing the game didn’t change my mind, but made me realize there’s a fundamental problem here that would exist without the direct comparison. It really has nothing to do with the art style itself; its grotesque children’s cartoon look does lend itself to some cool-looking stages. The problem comes down to the characters – they don’t look like they’re playing the game I’m playing. I’m trying to outsmart my opponent with swashbuckling skills, but my character is awkwardly bobbing and flopping about with a dumb look on their face. The character models are just too busy for a game that moves this fast; their goofy animations don’t provide good, clear feedback, at times making kills more confusing than gratifying. It’s amazing how a new coat of paint can change something so drastically; the gameplay is more enthralling than ever, yet when you sit back and watch something feels off. The original’s simplistic visuals were used to better highlighted its brutality, while this sequel aims for something more slapstick and misses the mark. Buyer, be aware – Nidhogg 2 is a multiplayer game to the core and not a hugely robust one at that. 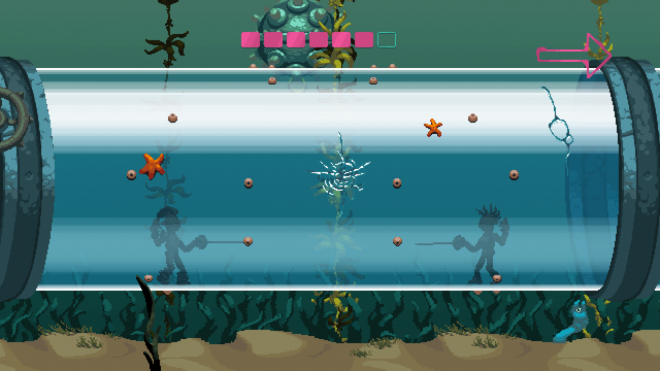 It has a single-player arcade mode, which is merely a short series of fights against increasingly difficult AI. It’s not nearly as good as fighting human players, but at least is an okay practice ground. Even with that extra mode, this is a small package: one character type with modest cosmetic customization, one modifiable game mode, four weapons and twelve unique stages. That’s it. On the bright side, everything here is pure quality over quantity. The game becomes familiar quick but is so helplessly addicting you’ll be playing for as long as you can find someone else to pick up the second controller. Nidhogg has always felt like the promise most fighting games make but set the bar way too high to actually deliver: two highly skilled combatants that have not only mastered their technique, but can read their opponent and counter accordingly. No memorization of strange combos or endless character variations, just simple controls with a highly balanced set of rules that make for a learning curve so smooth it’s practically nonexistent. 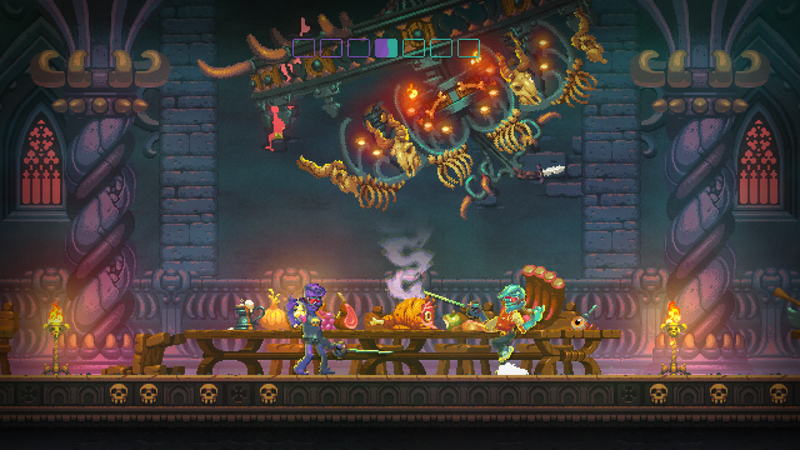 Nidhogg 2 adds some small but mighty innovations to the gameplay, making it feel fresh without ruining what made it so special in the first place. So what if the art is an eyesore? When you’re thirty minutes into a match and one duel away from the Nidhogg, it’ll be the last thing on your mind. 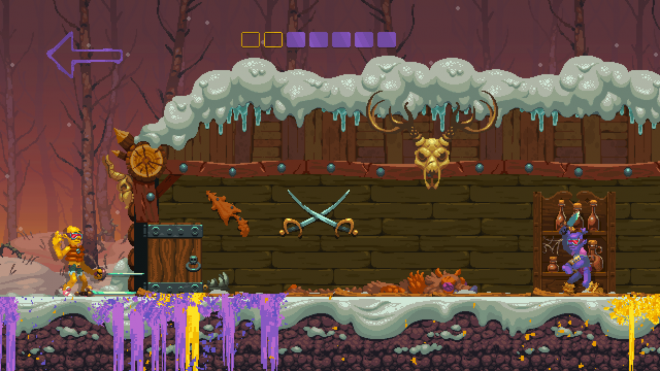 Nidhogg 2 was developed and published on Xbox One by Messhof. It was released July 19, 2018, for $14.99. A copy was provided for review purposes.